Finally it's drying out - well for a day or two anyway. 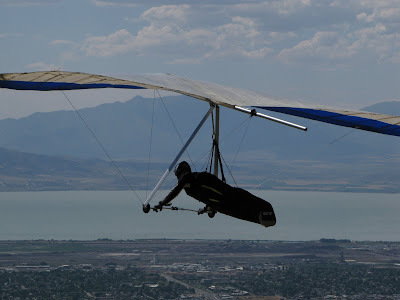 Cody and I met up at Inspo and flew our gliders. A few pics of the days activities. Last Friday a few of us flew the South Side at the Point, and again Sunday. Sunday the conditions were strong with winds topping out at just above 30. A strange thing happened - toward the end of the session I was flying a few hundred feet above launch in a significantly strong west component. Paul, a pilot from Minnesota, was flying with me. Paul set up to land, and I followed suit feeling like the air was getting a bit to wierd and strong. I set up to land on top, but found myself racing toward the edge of the hill as the wind was dramatically decreasing in velocity. My hard flair stopped me and the glider right on the lip. 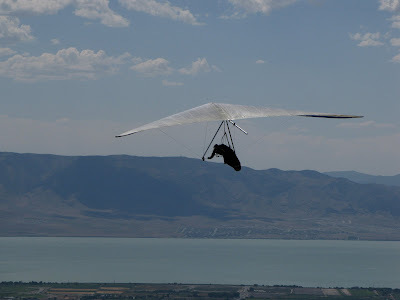 As I set my glider down the wind had almost completely died. I've never seen the wind go from 30+ to zilch in such a short time. 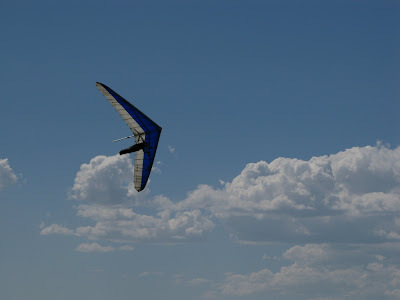 As soon as my glider was packed and loaded the wind picked up fiercely out of the north. A few pic from Inspo Taken by Paul Martin last year. Decisions, decisions. I got up this morning and decided to fly the Southside at The Point. I considered running down to Provo and flying Inspo, but in the end chose to fly The Point. My decision was based on 1) the fear that later in the day we would get another round of afternoon thunderstorms. 2) there were things I kinda needed to get done later, so a morning session at the Point would suffice. I arrived at the Point around 8:30am and missed the early cycle - it wasn't all that great from what other pilots reported. I did manage to get a couple of later flights in that added 20 minutes to my flight log. As I lingered in the waning late morning wind, I watched as beautiful cu's formed over Mt. Timpanogas and Cascade down by provo. It did OD north of the Point, but to the south down by Inspo, it looked like epic soaring conditions with possible XC potential. I considered quickly breaking down and jetting down to Provo, but figured if I stay at the point it's bound to get better. Besides I'm already set up! You can figure out the rest of the story. Just a quick blurb about yesterday.....Greg and flew Inspo on Wednesday. We launched around 3:30 into a straight stiff breeze that allowed us to ridge soar the main ridge at launch. Greg dominated the day with superior climbs. We both ended up with over an hours worth of airtime. We met up with Jeff O'brien and got to catch up with his current state. 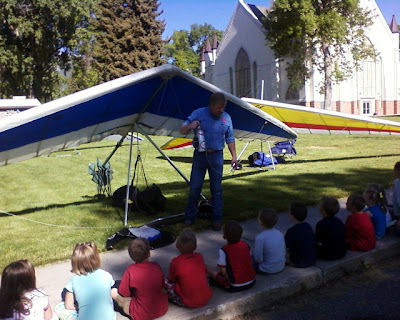 Last Friday was Flight Awareness day at Wellsville Elementary School. Matt Shoemaker, myself and Cody Dobson who is principal at the school, brought our gliders and participated in the event. Over 300 students filed through the different stations where there were lectures, static displays, RC aircraft and videos of tandem flights made by Matt. Cody spent months preparing the special event for his students, and worked hard as the spokesperson for our display. 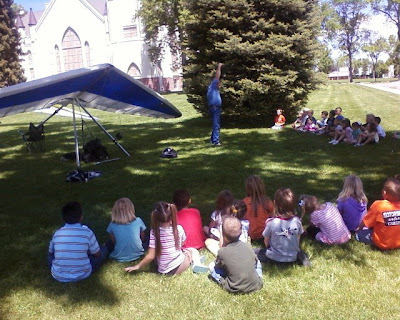 Most of the students in the groups were excited to see the hang gliders and hear Cody's ten minute talk. 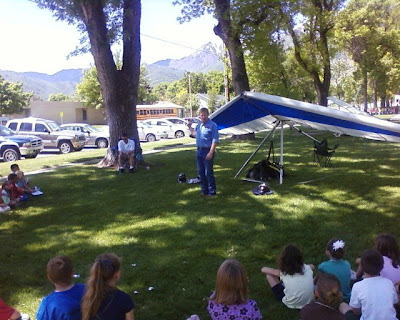 Matt commented about a similar event that took place during his school days that eventually led him to become interested in Hang gliding. The kids were extremely polite and very interested. Seems like a great idea - an effective way to promote our great sport!